Sit-Down Jewelry Showcases allow your customer to sit while you show off your merchandised items in a retail showcase. Bold Collection showcases are built with HPL slab end construction with 1 ½” decorative accents. 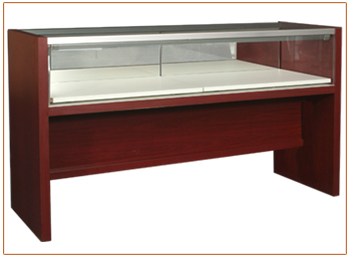 Jewelry display cases include frameless mirror doors. Glass display box is 12" high and 20" deep. Overall height is 34". Storage options are not available. Ask us about LED showcase lights and other fabulous custom showcase options.